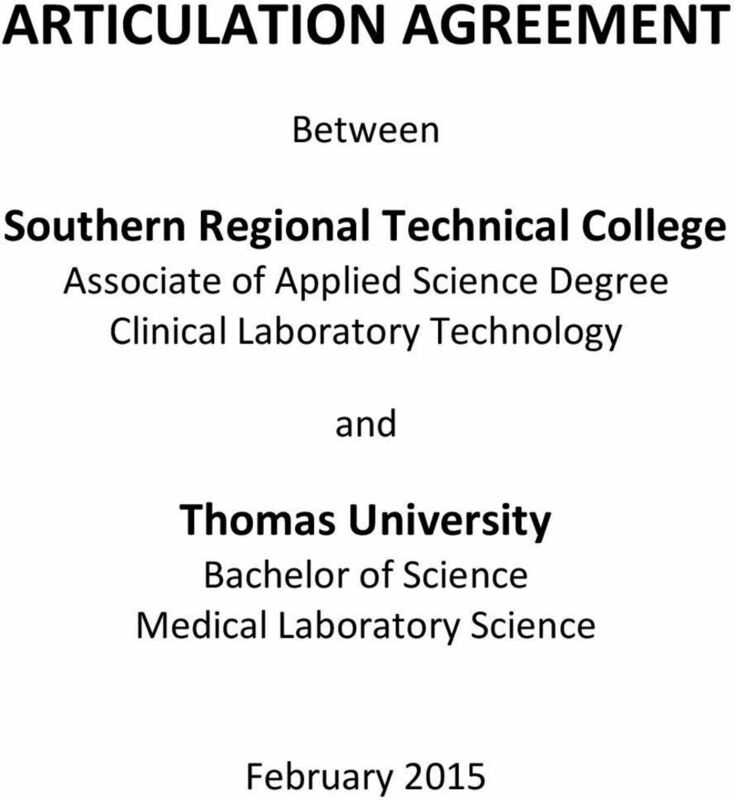 2 ARTICULATION AGREEMENT Between Southern Regional Technical College: Associate of Applied Science Degree in Clinical Laboratory Technology And Thomas University: Bachelor of Science Degree in Medical Laboratory Science Article I: Agreement on Principle Thomas University (TU) and Southern Regional Technical College (SRTC) agree that students who choose to transfer from a technical college to a senior college or university to earn a bachelor s degree should be provided with a smooth curriculum transition that minimizes loss of credit and duplication of coursework. 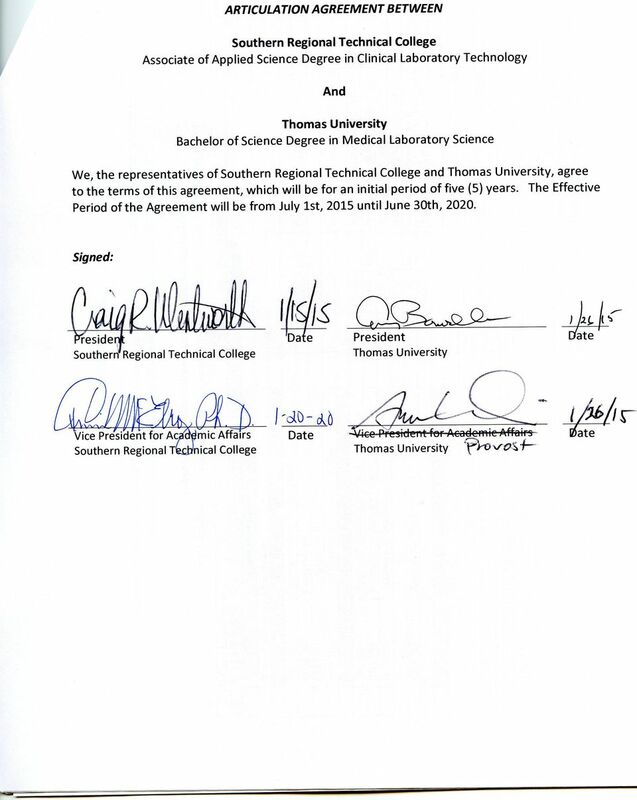 Thomas University and Southern Regional Technical College, therefore, agree to enter into this curriculum articulation agreement for students who complete the Associate of Applied Science Degree in Clinical Laboratory Technology at SRTC and transfer to TU to complete the Bachelor of Science in Medical Laboratory Science. Both institutions enter into this agreement as cooperating, equal partners who shall maintain the integrity of their separate programs. 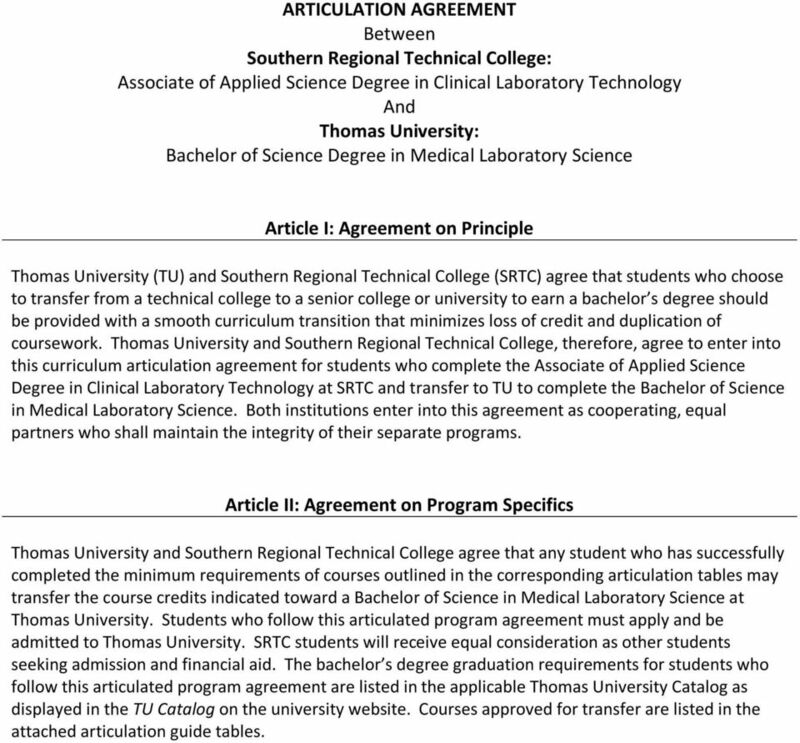 Article II: Agreement on Program Specifics Thomas University and Southern Regional Technical College agree that any student who has successfully completed the minimum requirements of courses outlined in the corresponding articulation tables may transfer the course credits indicated toward a Bachelor of Science in Medical Laboratory Science at Thomas University. 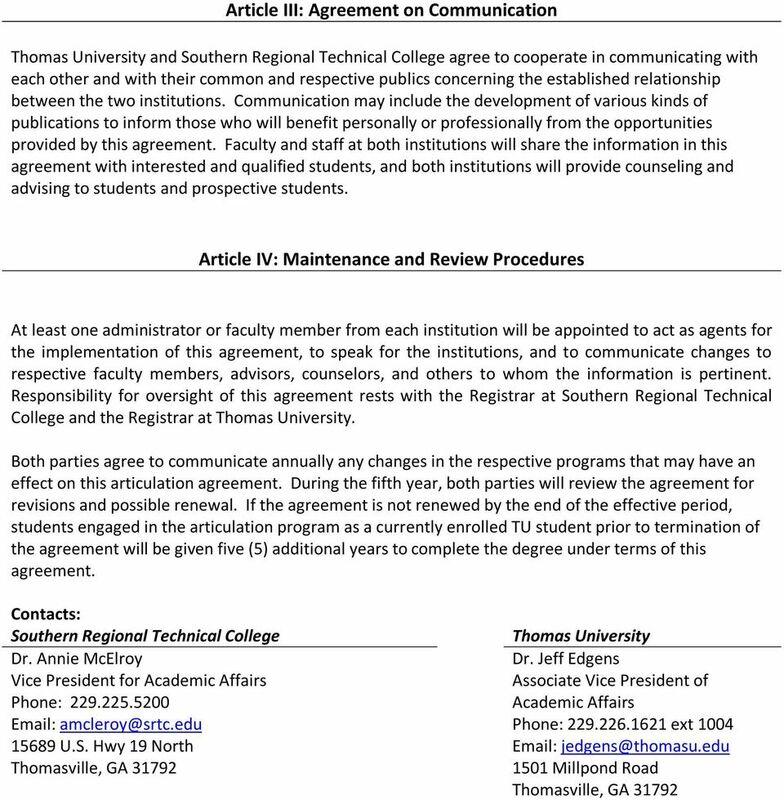 Students who follow this articulated program agreement must apply and be admitted to Thomas University. SRTC students will receive equal consideration as other students seeking admission and financial aid. The bachelor s degree graduation requirements for students who follow this articulated program agreement are listed in the applicable Thomas University Catalog as displayed in the TU Catalog on the university website. 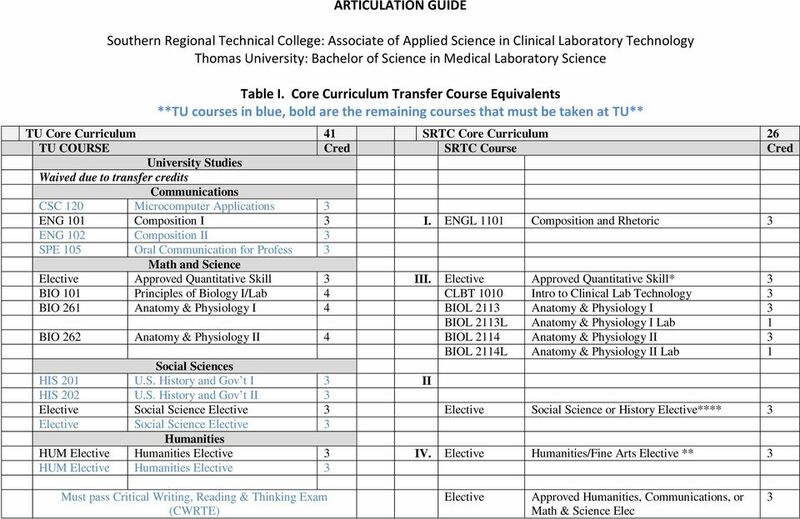 Courses approved for transfer are listed in the attached articulation guide tables. 3 Agreement Requirements 1. Students must complete the Associate of Applied Science in Clinical Laboratory Technology program at Southern Regional Technical College and the program of study for a Bachelor of Science in Medical Laboratory Science program at Thomas University as indicated in the articulation guide. Any course substitutions should be made with the guidance of an advisor or counselor to assure that all requirements are met. 2. Transfer students will be required to complete all Thomas University s general education (core) requirements that have not been satisfied in the Articulation Agreement. 3. Students who transfer to TU from SRTC must complete at least 35 semester hours at Thomas University. Thirty of these hours must be completed in the upper division course work appropriate to the program. 4. 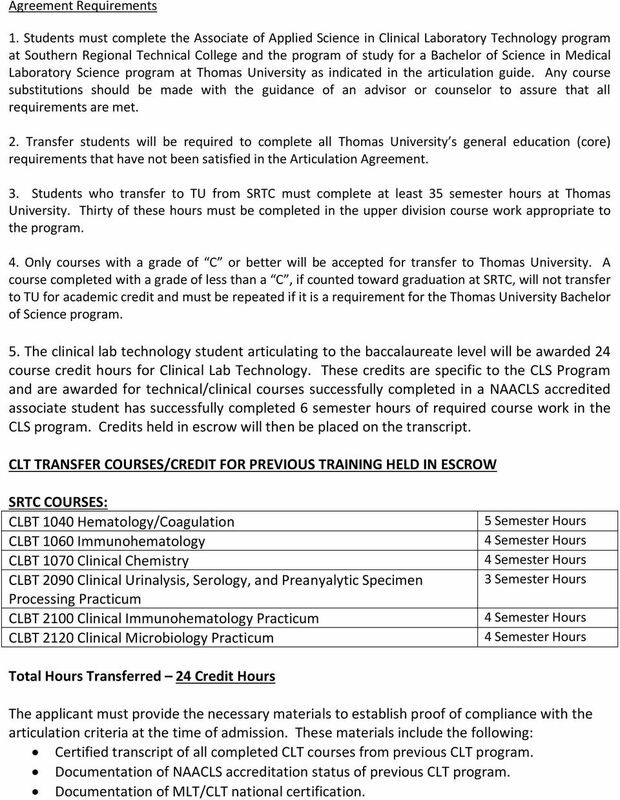 Only courses with a grade of C or better will be accepted for transfer to Thomas University. 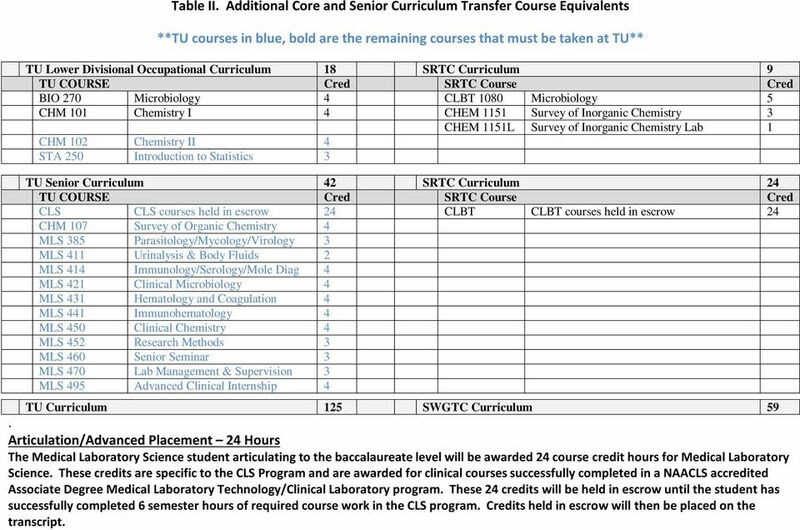 A course completed with a grade of less than a C, if counted toward graduation at SRTC, will not transfer to TU for academic credit and must be repeated if it is a requirement for the Thomas University Bachelor of Science program. 5. The clinical lab technology student articulating to the baccalaureate level will be awarded 24 course credit hours for Clinical Lab Technology. These credits are specific to the CLS Program and are awarded for technical/clinical courses successfully completed in a NAACLS accredited associate student has successfully completed 6 semester hours of required course work in the CLS program. Credits held in escrow will then be placed on the transcript. CLT TRANSFER COURSES/CREDIT FOR PREVIOUS TRAINING HELD IN ESCROW SRTC COURSES: CLBT 1040 Hematology/Coagulation CLBT 1060 Immunohematology CLBT 1070 Clinical Chemistry CLBT 2090 Clinical Urinalysis, Serology, and Preanyalytic Specimen Processing Practicum CLBT 2100 Clinical Immunohematology Practicum CLBT 2120 Clinical Microbiology Practicum 5 Semester Hours 4 Semester Hours 4 Semester Hours 3 Semester Hours 4 Semester Hours 4 Semester Hours Total Hours Transferred 24 Credit Hours The applicant must provide the necessary materials to establish proof of compliance with the articulation criteria at the time of admission. These materials include the following: Certified transcript of all completed CLT courses from previous CLT program. Documentation of NAACLS accreditation status of previous CLT program. Documentation of MLT/CLT national certification. 7 Table II. Additional Core and Senior Curriculum Transfer Course Equivalents **TU courses in blue, bold are the remaining courses that must be taken at TU** TU Lower Divisional Occupational Curriculum 18 SRTC Curriculum 9 TU COURSE Cred SRTC Course Cred BIO 270 Microbiology 4 CLBT 1080 Microbiology 5 CHM 101 Chemistry I 4 CHEM 1151 Survey of Inorganic Chemistry 3 CHEM 1151L Survey of Inorganic Chemistry Lab 1 CHM 102 Chemistry II 4 STA 250 Introduction to Statistics 3 TU Senior Curriculum 42 SRTC Curriculum 24 TU COURSE Cred SRTC Course Cred CLS CLS courses held in escrow 24 CLBT CLBT courses held in escrow 24 CHM 107 Survey of Organic Chemistry 4 MLS 385 Parasitology/Mycology/Virology 3 MLS 411 Urinalysis & Body Fluids 2 MLS 414 Immunology/Serology/Mole Diag 4 MLS 421 Clinical Microbiology 4 MLS 431 Hematology and Coagulation 4 MLS 441 Immunohematology 4 MLS 450 Clinical Chemistry 4 MLS 452 Research Methods 3 MLS 460 Senior Seminar 3 MLS 470 Lab Management & Supervision 3 MLS 495 Advanced Clinical Internship 4 TU Curriculum 125 SWGTC Curriculum 59. Articulation/Advanced Placement 24 Hours The Medical Laboratory Science student articulating to the baccalaureate level will be awarded 24 course credit hours for Medical Laboratory Science. These credits are specific to the CLS Program and are awarded for clinical courses successfully completed in a NAACLS accredited Associate Degree Medical Laboratory Technology/Clinical Laboratory program. These 24 credits will be held in escrow until the student has successfully completed 6 semester hours of required course work in the CLS program. Credits held in escrow will then be placed on the transcript.